Galago, or bushbaby (bush baby), is the common name for any of the relatively small, African prosimian primates comprising the family Galagidae (Groves 2005), characterized by a long, often bushy tail, large eyes, hindlimbs considerably longer than forelimbs, and all digits of the feet and hands bearing nails, with an elongated nail (grooming claw) on the second toe of the hindlimb. On occasion, bushbabies are placed within the Lorisidae (or Loridae) family as a subfamily. They also are known as nagapies, or "little night monkeys," in Afrikaans. Galagos are found only in Africa, but are widely distributed on that continent. Ecologically, galagos provide an important role in food chains, consuming insects, other arthropods, small mammals, fruit, and tree gum, and being consumed by various mammals (cats), birds of prey (owls), and reptiles (snakes). As insectivores, they help to control populations of their prey species, while their frugivorous diet likely helps in dispersal of seeds. For humans, while they occasionally are consumed, they largely have value in adding to the wonder of nature, are popular zoo attractions, and sometimes kept as pets. As pets, however, they are considered likely sources of zoonoses, diseases that can cross species barriers, as with many other primates. While galagos provide these important functions for the ecosystem and humans, some species are endangered (Galago rondoensis) or Near Threatened (Euoticus elegantulus, Galago alleni, Galago zanzibaricus, among others). Galagos are members of the taxon Strepsirrhini, which is one of the two suborders of primates, and one that also includes the prosimians known commonly as lemurs, lorises, pottos, and Aye-aye. Members of Strepsirrhini are known for their "wet noses," referring to the presence of the rhinarium, a wet, naked surface around the nostrils of the nose, such as found in most mammals, but lacking in the other primate suborder, the Haplorrhini. The Strepsirrhini (non-tarsier prosimians) also are called "curly-nosed" primates while the Haplorrhini (tarsiers, monkeys and apes) are known as "simple-nosed" primates. Galagos have tails that are always long relative to the body and generally are bushy. The eyes are relatively large, round, and are oriented obliquely forward. They have a reflecting layer (tapetum lucidum) behind the retina that aids night vision. The ears are moderate to large in size, membranous, and can be folded in the fashion of a concertina or accordion. The hindlimbs are significantly longer than the forelimbs. They have nails on all digits, although the second toe of the hindfoot bearing an elongated nail, or "grooming claw," that is angled away from the dorsal surface. The fur ranges in color from gray to black on the dorsal areas and white to orange-buff on ventral areas (Martin 2004). The smallest galago is the Demidoff's bushbaby, which has a head and body length of only 13 centimeters (5 inches), a tail of 18 centimeters (7 inches), and a weight of about 55 to 65 grams (2-2.5 ounces). The largest is the Brown greater bushbaby, which has a head and body length of 31.5 centimeters (12.5 inches), a tail of 41 centimeters (16.5 inches), and a weight of about 1100 grams (2 pounds, 7 ounces) in females and 1,190 grams (2 pounds, 10 ounces) in males. Only some bushbabies have sexual dimorphism in body size, which tends to be mild (Martin 2004). The eyes are adapted to give them good night vision, their hearing is acute, and the long tails give them good balance. According to some accounts, the name bush baby comes from either the animal's cries or appearance. The South African name nagapie, or "little night monkey," comes from the fact they are almost exclusively seen at night. Galagos are typically nocturnal and arboreal. Most are agile leapers and run swiftly along branches, and some species can leap several meters between supports and exhibit bipedal hopping on the ground. Some leap rarely and some are mainly quadrupedal (Martin 2004). Widely distributed in Africa, bushbabies are found in diverse habitats, including tropical rainforests, dry deciduous forests, and dry, thorny scrub (Martin 2004). Their diet is a mixture of arthropods (mainly insects) and other small animals, fruit, and tree gums (Charles-Dominique 1984). Species with larger size tend to be more frugivorous and species with smaller size tend to be more insectivorous. Euoticus species, the needle-clawed galagos, specialize in feeding on tree gums (Martin 2004). Most species are solitary foragers (Martin 2004). Galagos are polygamous and give birth typically to a single infant, although some species commonly produce twins, and there can be triplets as well (Martin 2004). After a gestation period of 110-133 days, young galagos are born with half-closed eyes and are initially unable to move about independently. After a few days (6-8 days), the mother carries the infant in her mouth, or it clings to her fur in some species, and places it on branches while feeding. Galagos live in social networks of some sort. Females maintain their territory but share them with their offspring. Males leave their mothers' territories after puberty but females remain, forming social groups consisting of closely related females and their young. Adult males maintain separate territories, which overlap with those of the female social groups; generally, one adult male mates with all the females in an area. Males who have not established such territories sometimes form small bachelor groups (Charles-Dominique 1984). Galagos communicate both by calling to each other, and by marking their paths with urine. At the end of the night, group members use a special rallying call and gather to sleep in a nest made of leaves, a group of branches, or a hole in a tree. Reports from veterinary and zoological sources indicate captive lifetimes of 12 to 16.5 years, suggesting a natural lifetime of the order of a decade. Galago (Groves 2005) or bushbaby species were placed in a single genus, Galago for several decades. Subsequently, it was recognized that the differences between species were substantial and four genera were recognized: Euoticus, Galago, Galagoides, and Otolemur (Martin 2004). However, there has been much recent study of the Galagidae and they now grouped into three genera, with the two former members of the now defunct genus Galagoides returned to their original genus Galago (Groves 2005). Several new species have also been discovered in recent years, and so the species size, or about 20 species, remains in flux. The name Galagonidae preceded use of Galagidae and there had been proposals to change the anme of the taxonomic group to Galagonidae on the grounds of priority. However, the International Committee on Zoological Nomenclature elected to retain the Galagidae name because of its widespread use (Martin 2004). 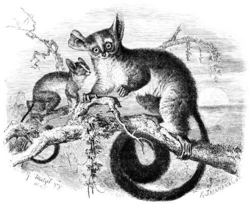 Several fossil species are known from the Miocene and are placed in the two extinct genera of Komba and Progalago, while fossils from the late Eocene also resemble bushbabies and are placed in the genus Saharagalago. Evidence exists that the Galagidae existed as a separate linage from the family Lorisidae for at least 38 million years (Martin 2004). A low-coverage genomic sequence of the Northern greater galago, Otolemur garnettii, is in progress. As it is a "primitive" primate, the sequence will be particularly useful in bridging the sequences of higher primates (macaque, chimp, human) to close non-primates such as rodents. The 2x planned coverage will not be sufficient to create a full genome assembly, but will provide comparative data across most of the human assembly. Charles-Dominique, P. 1984. Galagidae. Pages 332-337 in D. Macdonald, The Encyclopedia of Mammals. New York: Facts on File. ISBN 0871968711. Groves, C. 2005. Galagidae. Pages 123-127 in D. E. Wilson and D. M. Reeder, eds., Mammal Species of the World, 3rd edition. Johns Hopkins University Press. ISBN 0801882214. Harcourt, C. S., and L. T. Nash. 1986. Social organization of galagos in Kenyan coastal forests. 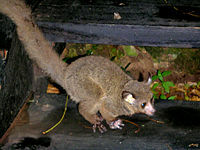 I. Galago zanzibaricus. American Journal of Primatology 10: 339-355. Martin, R. D. 2004. In B. Grzimek, D. G. Kleiman, V. Geist, and M. C. McDade, Grzimek's Animal Life Encyclopedia. Detroit: Thomson-Gale. ISBN 0307394913. Nash, L. T., S. K. Bearder, and T. R. Olson. 1989. Synopsis of Galago species characteristics. International Journal of Primatology 10: 357-369. This page was last modified on 17 May 2017, at 16:52.